Homer Middle School nationally recognized! 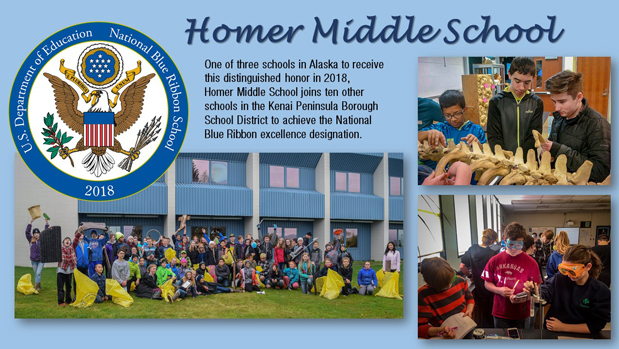 One of three schools in Alaska to receive this distinguished honor in 2018, Homer Middle School, in Homer, Alaska, joins ten other schools in the Kenai Peninsula Borough School District (KPBSD) to achieve the National Blue Ribbon excellence designation. Nationwide, 349 schools are honored with 2018 National Blue Ribbon School recognition. "Congratulation on your students' accomplishments and for your extraordinary commitment to meeting their unique needs," said U.S. Secretary of Education Betsy DeVos in an October 1, 2018, video message announcing the awardees. "We recognize and honor your important work in preparing students for successful careers and meaningful lives." 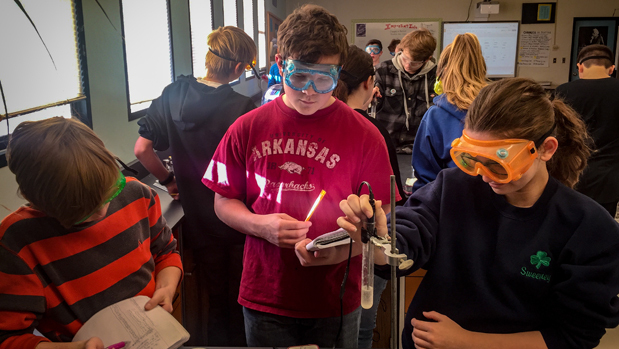 Homer Middle School is a 2018 National Blue Ribbon School, based on overall academic excellence or their progress in closing achievement gaps among student subgroups. "I am very proud of the effort our staff and students put in at Homer Middle School," said Sean Dusek, superintendent. "This is a very well deserved award that exemplifies what is happening around KPBSD. Congratulations Homer Middle School! Great job and I look forward to many more years of great leadership, excellent instruction, and significant student learning growth." 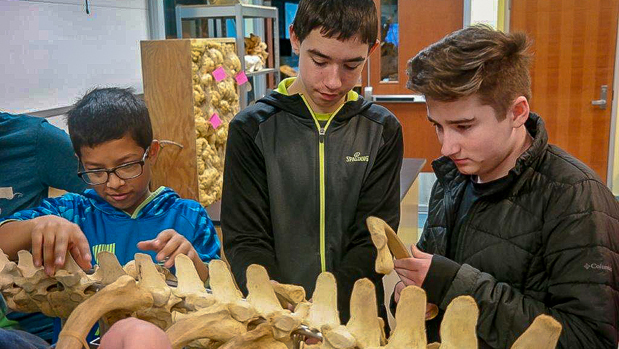 "These three diverse Alaskan schools are excellent examples of educational communities coming together to support all students, every day," said Alaska Education Commissioner Dr. Michael Johnson. "I am pleased that Homer Middle School, Pioneer Peak Elementary School and, for the second time, Stellar Secondary School are being recognized as National Blue Ribbon Schools. Congratulations to the students, staff, and families of these schools. Alaska is very proud of you!" The U.S. Department of Education will honor the 300 public and 49 private schools at a recognition ceremony on November 7-8, 2018, in Washington, D.C.